Whether she’s texting, dancing, or representing the United States all across the globe (she’s visited more countries than any other secretary of state), we unabashedly adore Hillary Clinton, scrunchies and all. Even political rivals – like Senator Lindsey Graham, who served as a manager in her husband’s impeachment trial – sing her praises. “She is extremely well respected throughout the world, handles herself in a very classy way, and has a work ethic second to none,” Graham told The New York Times. So, when she told reporters in early 2011 that she wouldn’t serve a second term as secretary of state or seek another public post after this appointment ends, we were hoping she’d change her mind. Sadly, though, it doesn’t look like HRC has had a change of heart. She recently told Marie Claire that she does not plan to run for president in 2016, and that she’s looking forward to being off the “high wire of national and international politics and leadership” and having her own time back. She has said she plans to write another book and continue fighting for women’s rights. Her husband told CBS’s Face the Nation that he has “no earthly idea” what she’ll do, but that she is tired and needs a break. So, as the first former first lady to serve in a president’s cabinet prepares to step down, let’s take a look back at some of the many reasons we heart Hillary. 1. She wasn’t afraid to go first. 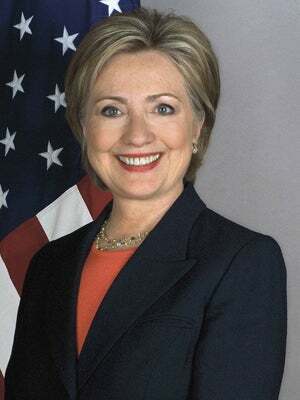 Hillary was the first student commencement speaker at Wellesley College, the first female chair of the Legal Services Corporation, the first female partner at Rose Law Firm, the first female board member of Walmart, and the first female senator to represent the state of New York. As Arkansas’ first lady, she helped reform the state’s education system. As the country’s first lady, she helped expand health insurance for children in low-income families and helped to create the Department of Justice’s Office on Violence Against Women. And all that happened before she ever ran for president. 2. She bends, but never breaks. When her husband was running for president, Hillary made an offhand remark about not staying home and baking cookies – and it made people completely lose their minds. So, when Family Circle magazine decided to hold a first lady cookie bake-off, she submitted a recipe. And won. When her opponent in her Senate race called her a “carpet bagger,” she went on a “Listening Tour” of New York and won the election with 55 percent of the vote. And while we can’t pretend to understand how difficult it must have been to go through the Monica Lewinsky scandal and ensuing impeachment proceedings as the wife of the accused president, Hillary kept her head held high and made the decision that she felt was right for her, no matter what everyone else thought. 4. She doesn’t cater to haters. Don’t like her pantsuits? Tough. Not a fan of the ponytail? Too bad. Hillary is like the honey badger in that way: She don’t care. Yes, the Marie Claire reporter who traveled with the secretary of state on a recent trip to Africa said she looked impeccable at nearly all times, but she says her hair is long because she got tired of having to get it done all the time. She seems to wear more fun jackets now than before, but she’s still owning her signature pantsuit look. And, while, unfortunately, there may never be an end to the comments about her appearance, she’s managed to ignore those criticisms and just keep doing her job. So, after that break… maybe we’ll see HRC in 2016?